Residing right along the Patapsco River, and closely to the Chesapeake Bay, it’s no wonder why the great city of Baltimore experiences issues with basement and crawlspace flooding. A flooded crawlspace in Baltimore homes and buildings can be a real nuisance, and provide serious health and safety hazards. Because most crawlspaces are located at or below ground level, they can be exposed to excess water and high humidity levels. If these conditions continue without any preventative measures, they can have lasting consequences on the condition of your home, and potentially your health. Therefore, the condition of your crawlspace can provide a clear indicator on how well the structure of your home is holding up. If you notice a flooded crawlspace in your Baltimore home, you need to make sure that you contact a professional basement waterproofing company to examine your property. By providing a crawlspace inspection and overall basement inspection, these waterproofing companies can understand the severity of you situation and know how to act accordingly. A flooded crawlspace can heavily affect the value and overall safety of your property. Firstly, water damages the foundation and structure of your home. When a wooden frame is exposed to the elements, it can swell and weaken. If this water absorbed in the wood doesn’t dry out, the wood can rot and further damage the strength of the foundation. While wood may be the most susceptible to water, concrete and cement are just as likely to absorb water, making it extremely difficult to dry out your flooded crawlspace. Secondly, mold and mildew grow rapidly in the presence of standing water and moisture. These bacteria filled colonies thrive in these conditions, and will release mold spores into the air. These spores have been proven to harm the human body’s respiratory system, and can cause major problems if they are allowed to manifest. Almost 40 percent of the air in your home comes from these crawlspaces. This is why it’s important for you and your waterproofing company to conduct a thorough crawlspace inspection of your Baltimore residence. 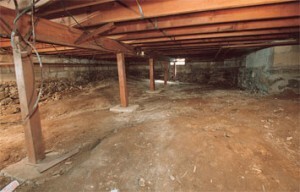 Lastly, a flooded crawlspace reduces energy efficiency. During winter months, you and your family might turn up the heat to keep the house warm. With a flooded crawlspace, any insulation that was installed to help regulate energy transfer is now null and void. Energy is allowed to escape through the wet crawlspace walls, forcing you to pay extra in energy expenses to keep your Baltimore home warm. All in all, it’s important that you conduct a crawlspace inspection and overall basement inspection of your Baltimore property. By doing a crawlspace inspection, you can make sure that your family is safe from potential structural damage and hazards to your health. You will also be making sure that you aren’t wasting money in your energy bills. While you have a basement waterproofing contractor conducting a crawlspace inspection, you should have them carry out a complete basement inspection. By doing this, the contractor can make sure that your basement is safe from condensation, runoff, and subsurface seepage that is known to cause problems for Baltimore homes. When dealing with basement waterproofing contractors out of state, they are most likely not aware of the local conditions that can affect you and your neighbors property. They may recommend a solution that may not completely fix your problem, costing an unnecessary amount of money and wasting your valuable time. You need a local, professional, and full-serviced basement waterproofing service to conduct crawlspace inspections as well as full basement inspections. Make sure to call one of these companies if you’re experiencing problems, and get rid of this issue once and for all!